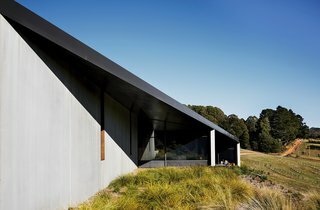 On a hillside about an hour’s drive from Melbourne sits the house that architect Kerstin Thompson designed for artist Titania Henderson and her husband, Ian, a retired orthopedic surgeon. It overlooks a verdant rolling valley and, in the distance, a mountainous outcrop called Hanging Rock. Thanks to the popular novel Picnic at Hanging Rock and its successful film adaptation, this odd geological formation has become a quintessential part of Australian folklore. (In the book, teachers lead a group of schoolgirls on a climb of the rock, several of whom are never seen again.) More recently, concerts nearby featuring Leonard Cohen and Bruce Springsteen have added to Hanging Rock’s fame.